The second day was jam packed with activities and adventures! 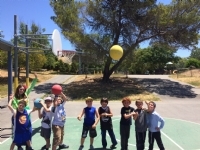 The campers got to display their own unique talents, from singing and dancing, to quoting Torah by heart, lego building and Basketball layups. It reminded us that each person is special and has their own way that Hashem entrusted them to make this world a place of goodness. We beautifully shaped our cookies! 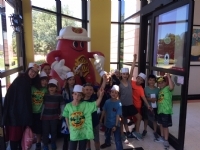 We enjoyed a sweet trip to the Jelly Belly factory, seeing first hand how they are made and getting to taste some of the wackiest flavors. We swam in a beautiful pool to refresh ourselves on a warm day. An incredible day!!! 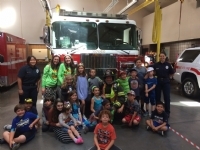 After learning about Shabbat, we had a tour of the Novato Fire Station. We had extra special perks since Ryan is our Jewish firefighter, he gave our campers the time of their life!! We even saw - hanging on the walls of the station - special thank you letters notes of made 4 years ago at our Jewish Kids Club. We got to go on the fire engine, even practice pulling out a fire fighter from a building. 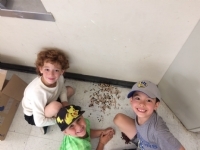 The campers creativity were in full display as we made cool sand art sundaes. We refreshed ourselves in a cool pool. We wrapped up the day with Challah making and a special hand on Shabbat party. We began the day with most important part! 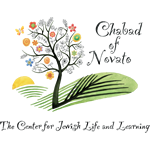 Studying Torah and tefillah (Prayer). We explored different prayers, Modeh Ani - Thanking Hashem for our souls and life, the Shema, and several others. 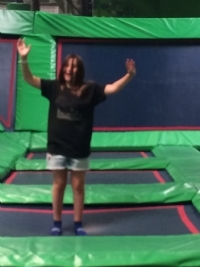 Just like Prayer connects us to the heavens, we took that message quite literally with crazy jumping and bouncers as we had the time of our life at Rebounderz!! The excitement and fun was so fun to watch! The Rebounderz really enjoyed our groups energy and manners. After a great workout, we jumped into the cool pool to refresh and relax. 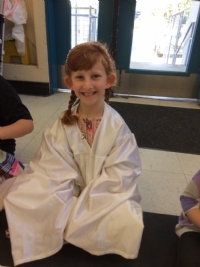 All in another fun day at Camp Gan Izzy!! Jam packed day at Camp Gan Izzy! We celebrated our very own Jewish mock wedding!! 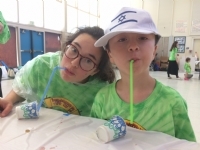 If you want to see authentic joy of being Jewish, you gotta see these pictures. Pure joy expressed through song and dance. We had every character at the wedding from the Bubby, to the brides maid and flower girls walking down the aisle to the Chuppah. We had a dun trip to Snoopy's Ice Skating, where we got to skate and even play the hokey pokey! We alos got to celebrate Chloe's 7th birthday with a birthday cake, blessings and more! WOWWW!! What an incredible day! 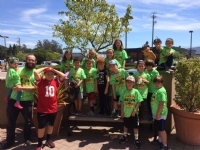 We met up with other Gan Israels across the Bay area. 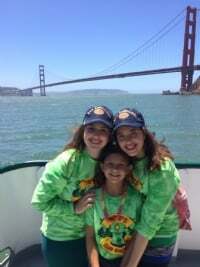 We were over 300 campers on a cruise ship which we rented. 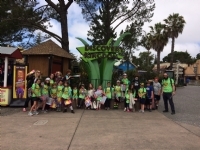 We got to see stunning views, and share the special camp energy, and we shared some words of Torah, danced with a Live Jewish music band (The Ferris Wheels) and enjoyed a magic show!! We came back to camp and learnt about the significance of a Jewish birthday. The special Neshoma that are gifted with and the trust Hashem has in us to fulfill our unique purpose and mission. We played a really fun game with each camper getting a prize after sharing something they learnt.